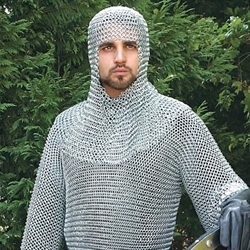 Our Butted Steel Chainmail Shirt features 1.6 mm thick links combined in the "international" pattern, with 4 links through a 5th, which was common to all European mail. Faithfully copied from examples in museums and private collections, the diameter of each outer link is about 7/16 of an inch, and the inner link diameter is about 3/8 of an inch. Mail shirt fits up to a 54 inch chest, 33 inch long shirt, sleeves are approximately 18 inches and hang to just below the elbows on average height warriors. We recommend keeping this butted mail shirt oiled when not in use. From the Celts of 300 BC to 18th century Asia, mail was one of the most prized items a warrior could own. The "Foe of Sharp Pointy Sticks" probably derived the name "mail" from the Latin "Macula" meaning net. Steel: 1.6mm Thick Mild Steel.